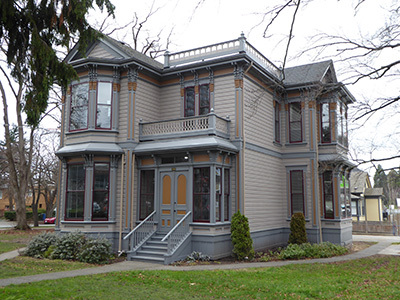 This house and its mirror-image at 514 Government St were built for $5,000 each by the Robson family for themselves and their daughter and her husband. This is a cross-gabled, two-storey, Italianate house with eclectic Queen Anne form. There is a front gable, two side gables, and a rear hip; to the right of the front gable and the rear hip are flat-roofed sections, originally with balustraded widows’ walks. There are full-height bays under all the gables, angled at the front, and box bays on the sides; the lower bays all have bracketed pent roofs which are in line with the string course. There are ornate paired Italianate brackets on the frieze above the corner boards and above the vertical window casings on all the windows on the upper floor. The rectangular, enclosed entrance porch to the right of the front bay is flat-roofed with a surrounding pent roof; its flat roof originally supported a balcony with sawn balusters. The house is clad in drop siding, and the foundation is of rubble stone. In 2018 the exterior was rehabilitated with a historic colour scheme and the lost upper balconies and widows' walk were restored. Close to the Legislative Buildings on what was Birdcage Walk, the house served all the social functions necessitated by the position of its owner. According to the Victoria Daily Times, 26 March 1885, architect Samuel Cyris Burris and engineer-partner, Mr. de la Penotiere designed this house for Hon. John and Susan Robson, who lived here until 1892. John was born in Perth, ON, in 1824. He married Susan, daughter of Capt. John Longforth of Goderich, ON, in 1854, and the couple came west in 1858. John worked at several occupations, including mining in the Cariboo, before establishing the British Columbian newspaper in New Westminster. John and Amor De Cosmos, owner and editor of the Victoria Daily Colonist, were bitter rivals who openly insulted each other. John Robson’s political opinions earned him jail time when he printed a letter suggesting that Judge Matthew Baillie Begbie accepted bribes. This event increased John’s popularity, contributing to his election as mayor of New Westminster in 1866 and Member of the Legislative Council until confederation dissolved council in 1870. After confederation, John was an MLA from 1871-75. Between 1866 and 1868, Victoria and New Westminster fought to be the capital of BC, and John originally supported New Westminster. When Victoria won, he moved here and worked for the Daily Colonist before returning to New Westminster. However, wishing to secure his political position, he returned here in the mid-1880s and built this house. Susan was thrilled to live close to her daughter, Frances Hunter, next door at 514 Government St.
John was elected MLA in 1883, serving as Minister of Finance and Provincial Secretary until selected as premier in 1889. He continued living here while premier until 1892. When on a business trip to England, he cut his finger on a hansom cab door, he contracted blood poisoning and died several days later. He was 68. Susan sold the house soon after and moved to a smaller residence. She died in 1918 at 85. The Robsons were strong supporters of St. Andrew’s Presbyterian Church on Douglas. From 1893-c.1895, Col. A.J. Kane of the Canada Western, then British Pacific, Railway resided here. Rev. Dr. William and Florence Nightingale (Leitch) Clay lived in this house until 1909, then built 821 Linden Av. William was pastor at St. Andrew’s Presbyterian Church and moderator of the Presbyterian Church General Assembly. He died at 65 while attending the opening of Canadian Parliament in 1928. Florence was active in the church, and president of the Aged Women’s Home Committee for 35 years. Florence died in 1945 at 81. In the 1910s, Mrs Hannah McDowell ran the Loraine Boarding House here. She died in Vancouver in 1931 at 83. From 1920-28, Frances (Grafton), widow of Joseph Squire, was the occupant. Born in Ontario in 1866, she died in 1958. In 1933, widow Rebecca Rennie moved in. The Rennie family came from Ontario in 1912, and lived in Fernwood. Her husband Robert was a stable man for his brother, William J. Rennie of the Imperial Bakery at 1284 Gladstone Av (Fernwood). Robert died in 1932 at 75. Rebecca lived in the house until her death in 1945 at 70. The BC Government then bought the property, and it has been used as offices since then. A plaque should commemorate the fact that BC Premier John Robson lived here.